Eight of 10 Occupy St. Louis protestors arrested in Kiener Plaza on Oct. 6 pleaded guilty in municipal court today to violating the city's ordinance banning people from being in city parks past 10 p.m.
Attorney Maggie Ellinger-Locke says the eight were sentenced to time served - about 24 hours - and Judge Richard Torack waived court costs. Ellinger-Locke called it a victory that individuals who "went to jail for justice" and were protesting economic inequality didn't have to pay any money. Ellinger-Locke says one defendant who asked for a trial was acquitted, and a second who was convicted received the same sentence as those who pleaded guilty. Trial dates for those arrested when police broke up the Occupy St. Louis protest on Oct. 23 and during a Nov. 17 sit-down protest at the entrance to the Martin Luther King Jr. bridge have not been set. 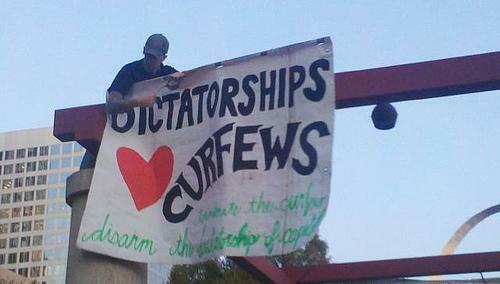 A federal case challenging the constitutionality of the city's curfew is set for trial in 2013. Demonstrators with the group OccupySTL are facing accusations of curfew violation after they were arrested in a downtown St. Louis park. Police arrested the protesters about 12:20 a.m. Thursday at Kiener Plaza, more than two hours after the park's 10 p.m. curfew. Police spokeswoman Katie O'Sullivan says 10 were arrested, but Colleen Kelly of OccupySTL says the number was 11 because a homeless person who supports the movement was also arrested. All but one of those arrested remained jailed by late morning Thursday. Occupy St. Louis has now announced via Twitter and Facebook that the time of enforcement is now 3 p.m. Friday. According to the group's Facebook page, city officials delivered two notices to the group, one of which lists the new time. This is a developing story. We will make updates to this story as we follow it. A federal judge in St. Louis has rejected attempts of Occupy St. Louis protestors to re-establish their encampment in Kiener Plaza. Attorneys for the protestors, who were evicted from the park early Saturday morning, had asked Judge Carol Jackson to stop enforcement of the city's parks curfew until the case went to trial. Jackson denied that request saying the protestors had not proven they were highly likely to win if the case went to trial. This is a developing story. We will update it with more information as we know it. Updated at 6:30 p.m. with quotes from Elliott and march organizer. 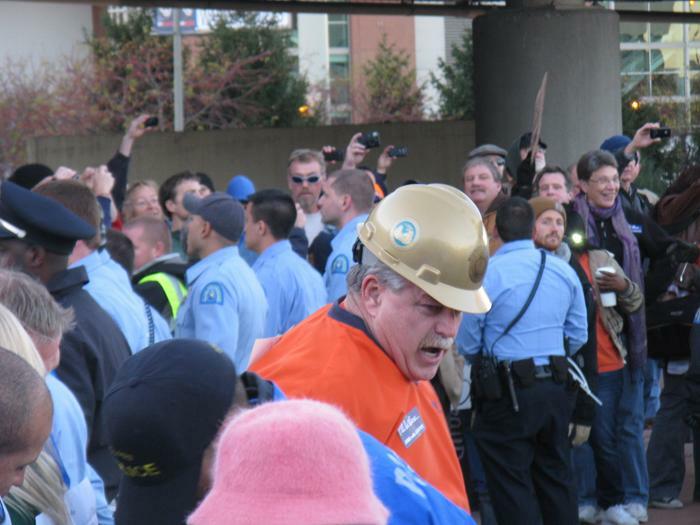 Update 5:05 p.m.: Among those arrested this afternoon was Gary Elliott, president of LIUNA (Laborers’ International Union of North America) Local 110, according to a press release distributed by Progress Missouri. In an interview during the march, Elliott said it was time for him to put his words into action. "It's one thing to say you feel sorry for people," Elliott said. "It's another thing to actually go out and actually take a little bit of risk to get the things that this country needs." 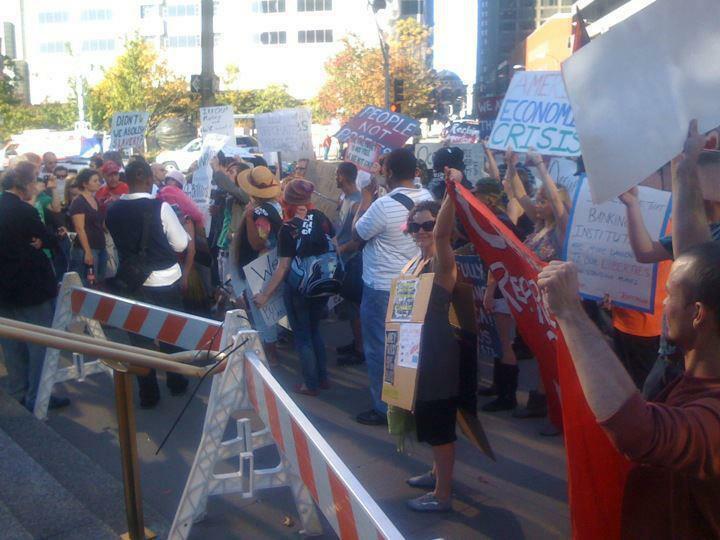 The march route took protestors past the local headquarters of Bank of America and the Federal Reserve. Johnathan McFarland, an Occupy St. Louis organizer, called it symbolic of America's misplaced priorities. "We need to rebuild our infrastructure," he said. "And people need jobs rebuilding the infrastructure as opposed to bailing out banks that don't really provide jobs." Most marchers returned to Kiener Plaza after the arrests, though a few continued on toward the City Justice Center, where the arrested protesters were taken. 14 people have been arrested this afternoon and the march of Occupy St. Louis protesters is making its way back to Kiener Plaza. Update: 4:36 p.m. via the Associated Press: At least a dozen Occupy St. Louis protesters were arrested after their attempt to block the entrance to a Mississippi River bridge on the two-month anniversary of the Occupy movement. Police were waiting on several hundred protesters when the throng arrived at the Martin Luther King Bridge shortly after 4 p.m. Thursday. About 15 to 20 protesters then sat down cross-legged, with their arms locked. 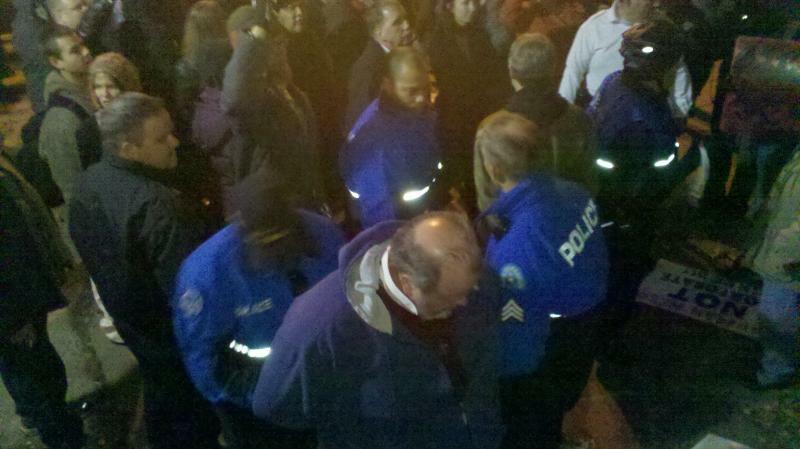 Officers moved in and arrested them when they refused to move. The crowd of protesters included labor unions and other sympathizers who marched from Kiener Plaza in downtown St. Louis to the bridge. 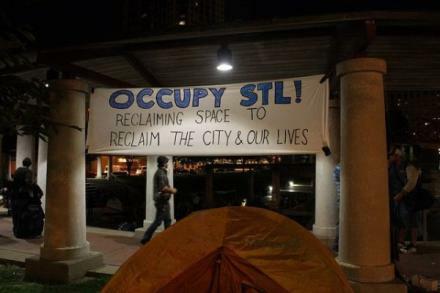 Members of Occupy St. Louis had camped in the plaza for several weeks before early Saturday, when police took down the tents and arrested demonstrators for curfew violations. About a dozen Occupy St. Louis protesters have sat down at the entrance to the MLK bridge. St. Louis police are moving in now to arrest them and telling those nearby to move away or they’ll face arrest as well. Hundreds more protesters are nearby. They marched from Kiener Plaza in downtown St. Louis to the bridge, as part of a nationwide effort to mark the two-month anniversary of the Occupy Movement.